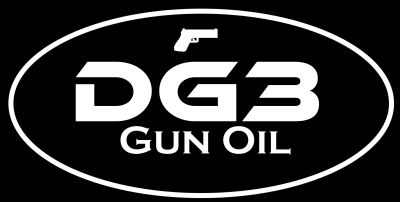 DG3 Gun Oil is the only oil that you can trust to actually work. Unlike other “Non-toxic” food based oils and all-in-one wonder bottles, DG3 Gun Oil works in the toughest conditions. DG3 Gun oil works by forming a micro coating on the gun. It is designed to push dirt, carbon and other particles away, not trap them like other oils. After initial cleaning and application of DG3 Gun Oil, you will notice your gun is easier to clean. DG3 Gun oil was made with the Officer in mind. On or Off Duty, Officers might spill coffee on their weapon during a pursuit, fall in a pool, sand and mud wrestling with a suspect or stand in the hot sun or the freezing cold conducting traffic accident investigations. In all temperatures and conditions, DG3 Gun Oil won’t run away from danger. With its deep penetrating properties, DG3 Gun Oil works great for cleaning stubborn carbon. It doesn’t contain any harsh cleaning agents like other CLP’s and it still breaks down carbon buildup for a fresh lubricated surface. DO NOT USE ON FRICTION LOCKING POCKET KNIVES. DG3 Gun oil reduces friction and will cause these knives to fold close even in the locked position.